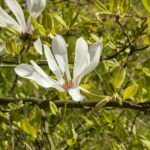 To grow a magnolia tree from the seeds, for indoor use? I’ve gathered these ripe magnolia red seeds from a magnificent tree (probably a hybrid) which I intend to use as an indoor plant. I learned from your website, and decided the best way for me to proceed is to plant several seeds in 4 small pots and buried them underground and under the same tree in the small park across my apt. window, where I collected the seed pods. Please give me your feedbacks and any suggestions that can help me. P.s. : I just love the shape of the tree and the glossy leaves, and I can use it as an indoor plant while it is very young and growing! !